Parsnip (pastinaca sativa), an umbelliferous plant, cultivated for its edible root. The name was written pastnip by the old herbalists, from pastinaca, the ancient Latin name. The parsnip is found wild in southern and central Europe and temperate Russian Asia and parts of Great Britain, and is introduced into this country; it is usually a biennial, sometimes in the wild state flowering the first year. It has a hard tap root with strong branches; an erect stem about 2 ft. high and branching; lower leaves pinnate, and more or less downy on the under side, the divisions sharply toothed and more or less lobed; the umbels of yellow flowers of eight to twelve rays, flat on top, without involucres; fruit about three lines long, oval; the conspicuous oil tubes run their whole length. In cultivation the root is much increased in size, almost without branches, and is soft and fleshy; the stem is much taller and the leaves longer and smoother than when wild. Prof. Buckman of the royal agricultural college, England, experimented on the improvement of the parsnip from the wild state. He found that the plants from seeds sown as soon as ripe, and. those from the same lot of seeds kept until spring and then sown, showed marked differences; and he regards the keeping of the seeds out of the ground, from the time they are ripe until they can be sown in spring, as an important step in cultivation, as it places the seeds in a condition quite different from their wild state. The roots in two generations from the wild seed showed differences in form, including specimens with tendencies in their shape toward that of the established cultivated varieties. Selecting a root of promising appearance, he continued to breed from this, and by careful selection established a variety which in ten years was put in the seed market as the student parsnip, which still maintains a high reputation. Parsnips were held in much esteem by the Romans, who boiled and ate them with honey; the leaves were eaten to promote digestion, and it was believed that if a portion of the plant were carried about the person the wearer would never be stung by serpents. - In cultivation parsnips do best in a light rich soil, which is better if manured the previous autumn; the seeds are not to be depended upon if more than a year old; they are sown in drills 15 in. apart, as early as the soil can be worked, thinned to 6 in. apart, and kept free from weeds until the leaves are so large as to prevent working between the rows. As the root is perfectly hardy, it is harvested after more tender kinds have been cared for; the roots are stored in trenches covered with litter, or placed in barrels or bins with sand or sandy earth among them to prevent drying. It is customary to leave a portion of the crop in the ground over winter, as many think the freezing it is subjected to renders the root more sweet and tender; but such roots should be dug as soon as the frost is out, as growth starts early, and if they begin to grow their quality is impaired. The varieties are few. The common or Dutch parsnip has a root 20 to 30 in. long and 3 to 4 in. in diameter at the shoulder, occasionally with a few strong fangs or branches. The Guernsey has very long tapering roots; on the island of Guernsey, where they are an important crop, it is not unusual for them to be 4 ft. long. 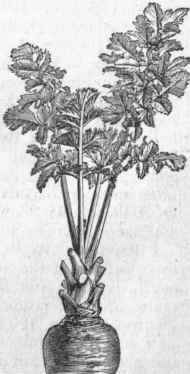 The hollow-crowned has a depressed ring around the insertion of the leaf stalks, for which reason it is also called the cup parsnip; it is about 18 in. long and 4 in. in diameter at the shoulder, ending somewhat abruptly in a small tap root; this is the variety most cultivated. The round or turnip-rooted is very broad in proportion to its length. The student has a superior flavor. The yield is from 500 to 800 bushels to the acre, according to the soil. The root contains water 85.05, albuminoids 7.30, sugar 2.88, other carbohydrates 6.77, besides a small amount of oil and inorganic matter. An infusion of the roots contains sufficient sugar to form when fermented with hops a kind of beer, and a marmalade and»parsnip wine are made from them.